Happy Thanksgiving! I made this cute card to go along with a pair of turkey cookies that I gave to a special pair of little girls. The turkey is from Lawn Fawn's Turkey Day stamp set. I colored him up with Copic markers, then carefully cut him out by hand since I don't have the matching die. Just a note here--the colors on the turkey (and the card) match this week's Color Throwdown challenge, which you can check out HERE. The turkey was adhered to a pair of layered circles using foam tape. I positioned the turkey at the top of a patterned paper panel with a double ended red fishtail flag strip across it, then adhered the pieces on a golden yellow cardstock panel. 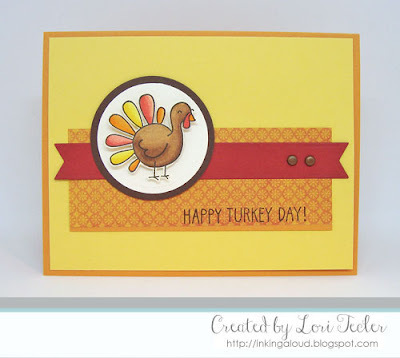 The set's "happy turkey day" sentiment was stamped along the bottom of the patterned panel. On the stamp, the words are stacked on top of each other, but since the stamp is clear, it was super easy to stamp the words in a straight-ish line along the bottom of the patterned paper. A pair of copper brads at the right side of the fishtail flag strip balanced out the design. The finished panel was adhered to an easy to write on orange card base. So super cute! Hope you had a wonderful Thanksgiving!